Over the past two weeks I’ve probably eaten about 30 of these adorably, delicious mini carrot cake bran muffins. Recipe testing…. It’s a tough job but somebody has to do it around here! As it turns out, little Noah, who’s now 9 months (!!! ), is turning out to be quite a good little taste tester himself. He may not be able to give verbal critiques just yet but, let me tell you, his body language is spot on. Admittedly, I got a little heavy handed with the molasses on the first batch. One taste and well, Noah looked me square in the face and did a full body shiver. If he had arm hair I’m pretty sure it also would have been standing straight up. I tried not to laugh about the fact that I just completely disgusted my own child but it was just too cute. Needless to say I went back to the mixing bowl to try again. 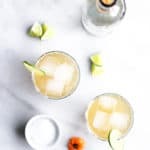 How was the second batch you want to know? That one got two enthusiastic arms up from my little pint-sized judge in the black Ikea high chair. I consider that a victory after round one’s hysterical disappointing results. 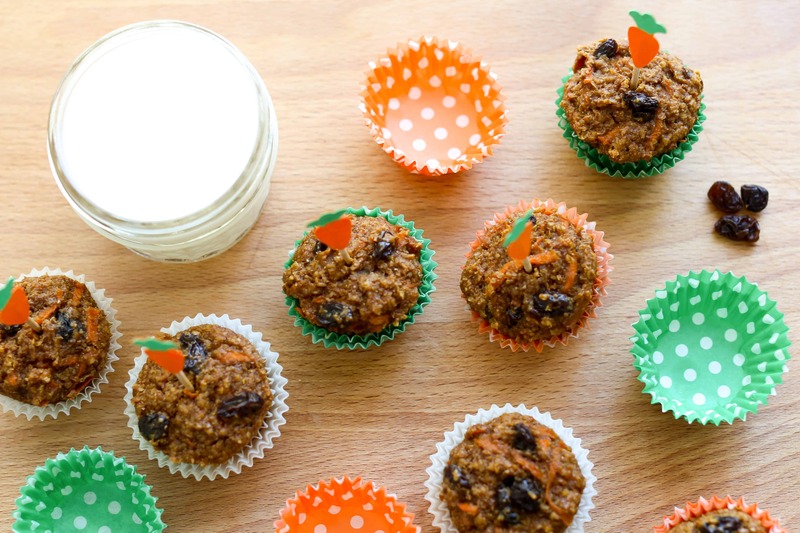 What I love about these muffins, besides that they are seriously delicious and now have the perfect balance of molasses, is how nutritious they are. 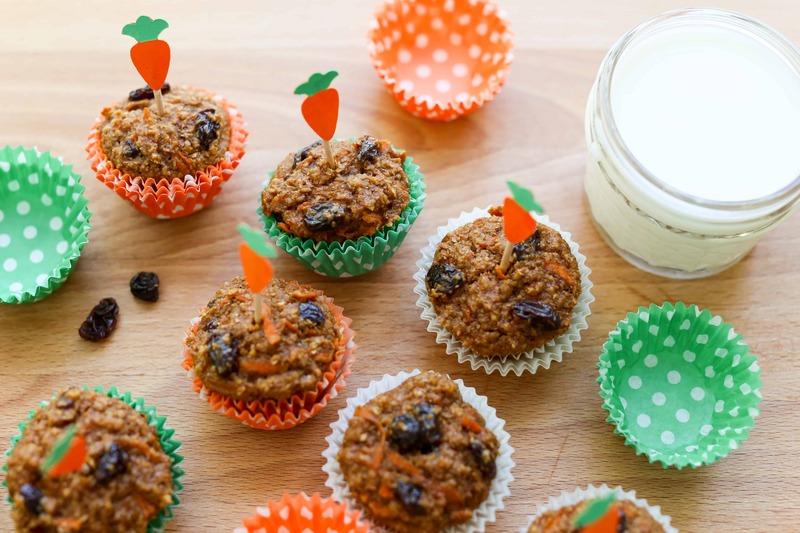 Thanks to whole grains, like hearty oat bran soaked in milk, just four of these mini muffins provide 7 grams of quality protein and 6 grams of fiber. Add an 8-ounce glass of milk to wash them down and you’ve got a great breakfast or snack with a solid 15 grams of protein. 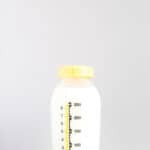 With 9 essential nutrients in each 8-ounce glass, milk is a delicious, simple and wholesome way to give kids natural, high-quality protein, plus other important nutrients they need like calcium and potassium. 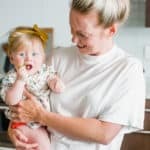 It’s important for kids (and their busy parents!) to get protein at every meal — especially breakfast, since it keeps us feeling satisfied. Having a glass of milk with breakfast does wonders for keeping the mid-morning hungries at bay and helps everyone stay focused, which is especially important this time of year as summer vacations come to an end, parents return to work and the kiddos head back to school. Mornings feeling a little rushed these days? Silly question, I know. Throw a few of these little guys into a plastic baggie, pour some milk in spill-proof cup and you’ve got a nutritious breakfast to take on the go. 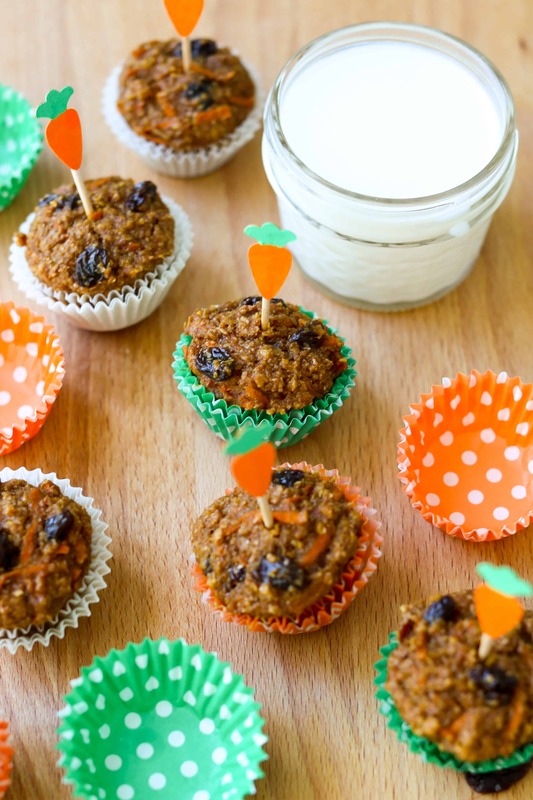 If you’re looking for a nutritious, make-ahead breakfast or snack that both kids and their busy parents will love, these mini carrot cake bran muffins are the way to go. I’m willing to bet your kids will also give them two enthusiastic arms up! Preheat oven to 350 degrees and lightly coat all 24 cups of a mini muffin pan with a bit of nonstick coconut oil cooking spray. In a small bowl, combine oat bran and 1 cup milk. Stir well and set aside to allow the bran to absorb the milk. In another bowl, combine whole wheat flour, baking powder, cinnamon, nutmeg and salt and whisk to combine. In a third large bowl, whisk together egg, coconut oil, and vanilla extract just until combined, then stir in molasses, honey and brown sugar. Add both the bran and flour mixtures and stir until just incorporated. Lastly, fold in the shredded carrots and raisins. Using a 1 1/2 tablespoon scoop, divide the batter into the oiled muffin cups. Bake at 350 degrees until a toothpick inserted into the center comes out clean, about 11-13 minutes. Cool in the pan for a few minutes before carefully transferring to a wire rack. Repeat with any remaining batter. 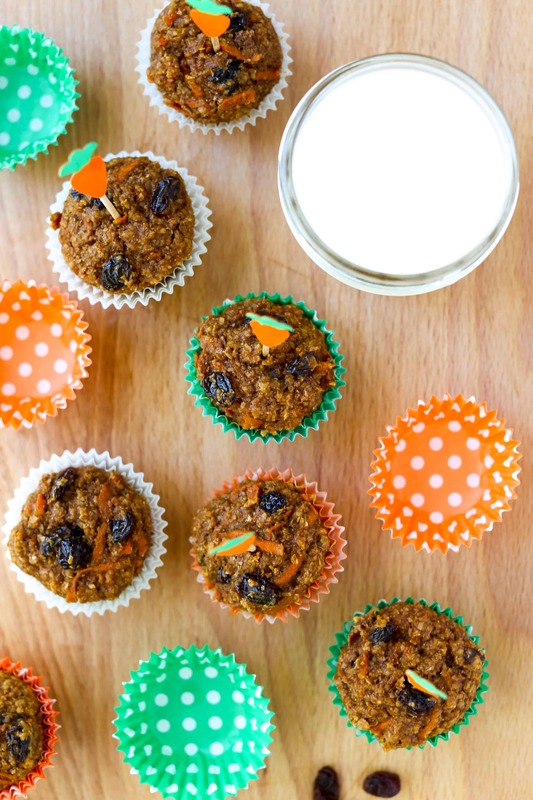 Serve muffins with remaining 8-ounce glass of milk and enjoy! Remaining muffins can be stored in an airtight container on the counter for up to 4 days, or in the refrigerator for up to 1 week. Muffins can also be frozen and defrosted for a quick breakfast or snack in the future. Hi Shannon! I’d think wheat bran would also work great. If the batter seems a bit too thick I’d recommend adding more milk, 1-2 tablespoons a a time until the consistency is right. Love the doors on the new home! (I’m a Realtor) Bend is a gorgeous area. Thanks for the great recipes too! The pea hummus, is “the bomb”! just saying.